Does your company allow pets in the office? Here are a few tips on how to ensure they are safe! June 24th is International ‘Take Your Dog to Work Day’, this day not only celebrates the companions dogs but this day offers employees the chance to introduce their dog to their co-workers promoting the benefits of pet ownership and encouraging animal adoption. Many scientific studies have concluded pets in the workplace positively impact your employees’ morale, their work productivity by reducing their stress level. The presence of pets can substantially increase job satisfaction and morale. Companies that welcome pets in their offices have reported a decrease in employee absenteeism from work. It’s important however to ensure that you have put into place a pet-friendly office policy that takes into account the health and welfare both of your employees and their pets. We have put together some general notes on basic safety tips in order to make the experience run smoothly. Create safe areas for pets such as at the employees’ cubicles or inside an offices so they will can feel relaxed. You can try using child-proof safety gates so pets can be accommodated within one area. Ask your employees to bring in their pet’s favorite blanket, dog bed, toys, food and water bowls so animals feel comfortable and safe in the new environment. Research if the plants around from your office are poisonous to pets. Do not assume that if they are not poisonous to humans they will not make your pet sick if. If you want to make pets feel like they are part of your office family you could try placing a bag of treats around the office. Lint rollers, clean up bags for waste as well as a good carpet cleaner should be kept handy in case things go messy. Let your cleaning company know about bringing the man’s best friend into the workplace policy. Ask them to thoroughly wash and sanitize floors and all other surfaces where pets had been located. In case there are any employees with allergies you should also consider not only vacuuming the carpets but also shampooing the carpets once every quarter in order to get rid of dander and animal hair. By following these pet-friendly guidelines you could create a fun, safe and positive work environment for your employees as well as for their beloved pets. It’s time to give your dog a job! Whether you are running a large division, regional area with multiple units or one single account, it’s likely that your company is spending a significant amount of capital and human resources in your janitorial needs. Therefore, KPIs would help to determine if you are getting a positive return on your investment. 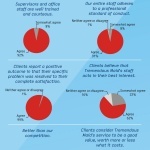 Below are 6 major categories of KPIs that your janitorial service provider could report to you. Most companies would have these numbers calculated for internal purposes but many companies could easily share these numbers with their clients. 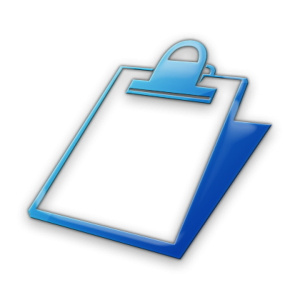 If you want access to the report or want a report created just for you make sure to let your cleaning provider. 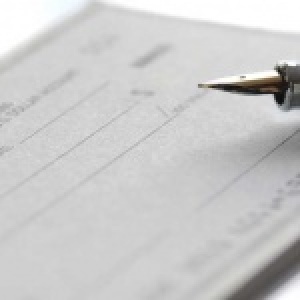 If the reports are time-consuming and not something that the company normally tracks, they may request a modest rate increase to cover the payroll related to putting together any reports for you. These KPIs will help to establish which areas are performing according to plan and which areas need further improvement. 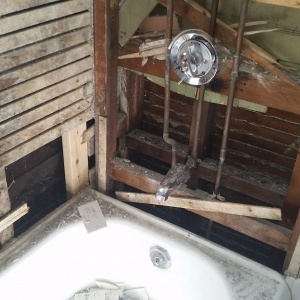 Internal inspections are tracked often and put into a spreadsheet to get the average results. Anything from which areas cleaners are performing well, which areas are ok and which need much more immediate improvement…if a cleaner is not performing up to company’s standards, most likely the cleaner is provided with more training. It’s for this specific reason that regular inspections are key to ensure a company is delivering on their promise to you –the client. Some companies want to get all the regular inspections while others only want the quality audits. Quality audit reports should be sent to you on a quarterly basis or semi-annually. This KPI can include several items such as: results of client surveys or the number of special requests you —the client has submitted compared to number of special requests your employees have completed. Note: If you have dozens of locations, this can be highly effective for regional operations managers. This helps to track employee satisfaction by branch over a period of time. 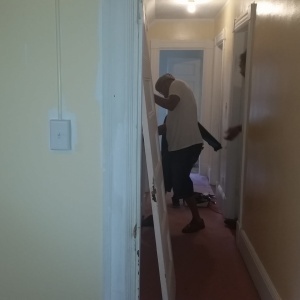 Number of training hours provided for cleaning procedures, safety and policies – especially if you have several branches and have done some renovations with different floor types and surfaces that need special attention. Number of times a specific employee is sent back to training –and for which training areas? The more you know the better your chances of further evaluating your current provider when it’s the time to put up your contract again for bidding. Note: This can be useful again if you have multiple locations —knowing the safety numbers during different seasons to evaluate if something is wrong with your floors or need a different type of cleaning chemicals or frequency. For example, if there have been 2 accidents in the winter, and you have tile floors in the entrance to avoid your own clients from injuries placing an entry mat in each entrance could save you lots of headaches. Comparison of actual expenses to budget, to include labor, equipment cost, chemical cost and consumables cost. Note: if you request for the cleaning company to quote you on paper / consumables for bathrooms and kitchens – it would be good to track down month vs month statements and year vs year so you know if there is a significant increase in products. With these numbers you can also easily determine the next year budget. Keep it simple – most companies won’t want to share much because for many companies is hard for them to track their ‘numbers’ so have honest /open conversations, discuss the goals of your organization and allow the cleaning company to help you with the process of figuring out which KPIs may make sense for you. 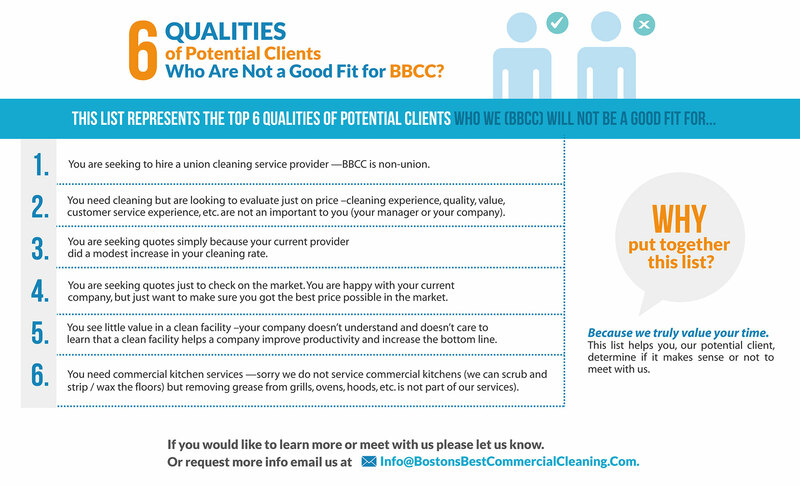 Are You a Good Fit for Boston’s Best Commercial Cleaning? Who we are NOT a good fit for? 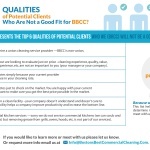 6 Qualities of Potential Clients Who We Will NOT be a Good Fit For…see the infographic here. You are seeking to hire a union cleaning service provider —BBCC is non-union. You need cleaning but are looking to evaluate just on price –cleaning experience, quality, value, customer service experience, etc. are not a important to you (your manager or your company). You are seeking quotes simply because your current provider did a modest increase in your cleaning rate. You are seeking quotes just to check on the market. You are happy with your current company, but just want to make sure you got the best price possible in the market. You see little value in a clean facility –your company doesn’t understand and doesn’t care to learn that a clean facility helps a company improve productivity and increase the bottom line. 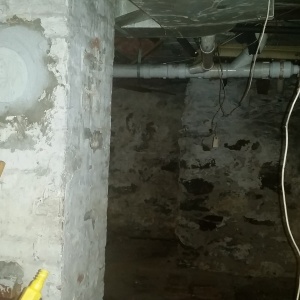 You need commercial kitchen services —sorry we do not service commercial kitchens (we can scrub and strip / wax the floors) but removing grease from grills, ovens, hoods, etc. is not part of our services).